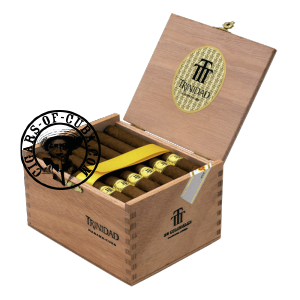 This is the Trinidad cigar that can be enjoyed by everyone. The flavors are so comforting: coffee, vanilla and cocoa injected with hints of sweet honey. This is more like having a Cappuccino than a cigar, making it a firm favorite with new smokers. The construction is stunning, perfectly finished with its golden pig tail. This cigar can be enjoyed even young, without experiencing any type of harshness. With this Petit Corona size, Trinidad has proven that a Petit Corona can also develop rich and smooth taste. Recommended for beginners and smokers who are seeking a new cigar line.